Slip and trip accidents are some of the most dangerous and costly causes of injuries around the world. Therefore, slip resistant flooring is a health and safety must-have for most industrial and commercial facilities, as otherwise it’s only a matter of time until a member of staff or customer suffers a painful and costly accident. Slips and trips can happen anywhere, at any time, to anyone. It’s important to address the slip resistance and maintenance of floors to prevent such accidents and enhance floor safety. The diversity of slip resistant floors on offer means that there is a solution for any environment, whether it’s a shopping centre’s food hall, prone to dropped snacks and fizzy drinks or a heavy manufacturing plant that needs to account for oils, greases and fuel. To help you choose safe floor for your facility, we’ve answered some of the most commonly asked questions about anti-slip flooring. 1. 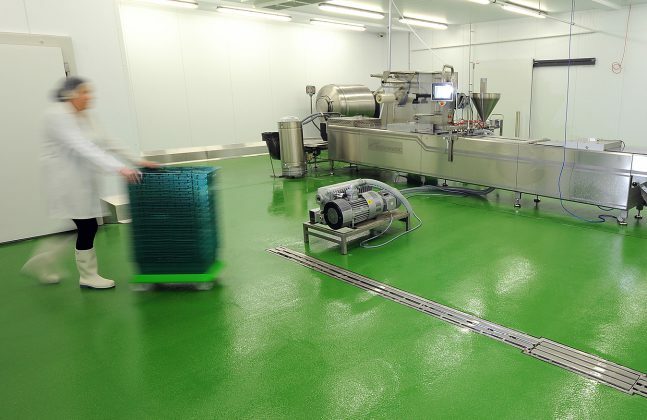 What are the key benefits of anti-slip flooring? 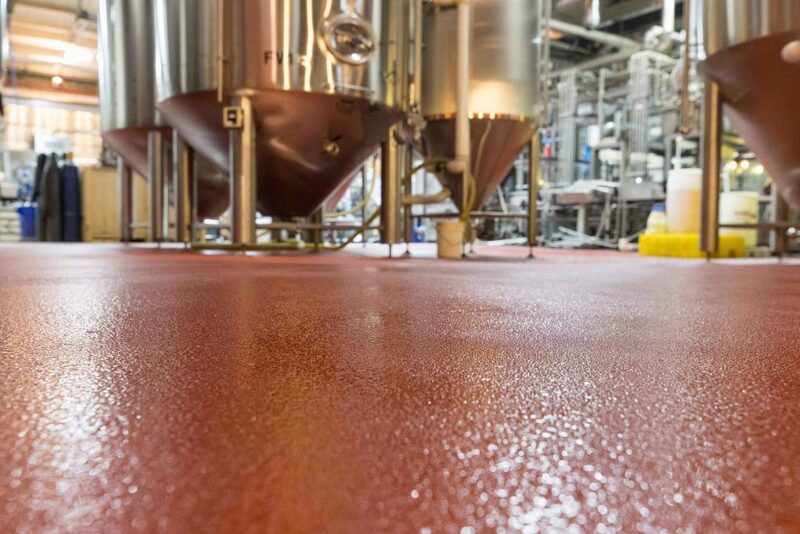 US craft brewers, Brooklyn Brewery, installed a durable and slip resistant, cementitious urethane in its main production hall. 2. What is slip resistance? In order to understand slip resistance, a metric is used to gauge the slipperiness of a floor. The coefficient of friction (COF) may be defined as the force necessary to hold two materials together (the foot and the floor) and the maximum force necessary to resist sliding. In fact, a study from the University of Michigan recommends a COF of 0.5 as a reasonable guide to provide proper slip resistance, although certain activities such as carrying items, pushing or pulling objects or walking up and down-inclined surfaces may require higher COF. A high performance, epoxy resin coating was installed at Flowcrete UK’s warehouse to deliver an anti-slip profile by inclusion of aggregates between coats. 3. What are the critical points to remember during cleaning? For some projects, a less aggressive slip resistance is needed with a greater focus on its cleanability. The more aggressive the slip resistance of the floor, the harder it will be to clean. This is due to the aggregate that is broadcast onto the coating of an aggressive slip resistant component being larger and more angular. The more angular the profile of the floor surface, the more difficult it can be to clean. Challenges arise when a more aggressive slip resistance such as R12 is needed – cleaning equipment such as a mop will be torn to shreds in this instance. 4. What factors influence the slip resistance of a floor? Testing floors and surfaces in situ can identify a number of factors that influence the slip resistance of flooring materials: e.g. cleaning regime, maintenance, contamination, deterioration due to wear and traffic pattern. 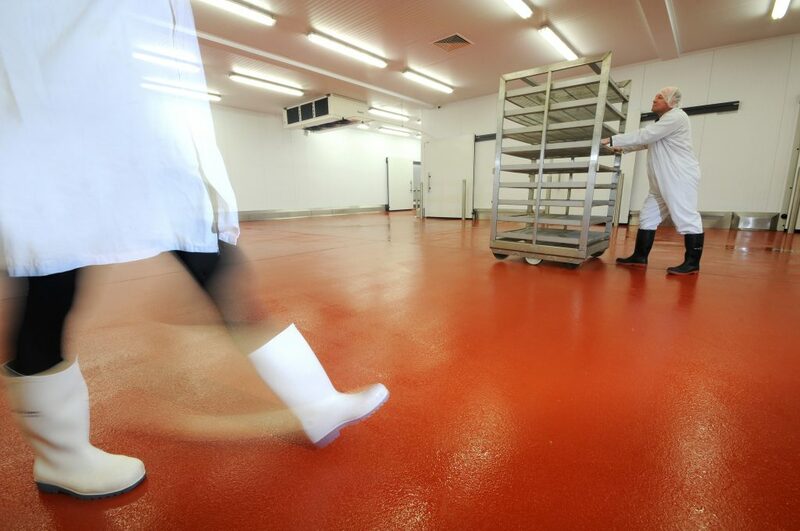 Eurostock Foods in the UK is prone to wet conditions underfoot and so installed a floor with a high level of slip resistance to protect its staff. 5. What are the commonly used anti-slip test methods? This is a laboratory test for gauging the sureness of footing through producing the popular “R” rating-from R9/light anti slip all the way to R/12, or R/13 aggressive anti-slip. When talking about “R” rating, you are talking about a measurement, which is designed in a laboratory utilising an inclined and oily surface geared towards replicating that in the field, with slip-resistant floor. This method is the standard anti slip floor test in the UK and Australia. The test has been designed to imitate a pedestrian heel strike to the point at which slips most occur. When a pedestrian heel strikes a wet floor a fluid film is created between them, which can cause a slip. This test works in wet conditions because it produces a similar fluid film between the slider and the floor. It can be used to accurately test the slip potential on clean and dry or contaminated floors and also works with dry contaminants. It is the preferred method of testing, as it is portable and works in the conditions that slip accidents happen. Want to find out more? Leave a comment below and we’ll put you in touch with a local flooring expert! To ensure work safety, industrialist must always use anti-safety materials for their workers. Installing anti-slip floor can enhance the safety level to an extent. Anti-slip materials reduce the chances of industrial accidents and help workers to work under a safe zone. This article is very useful and informative one. Thanks for sharing. There are some great benefits in here about anti-slip flooring. Like the prevention of slip and fall accidents, creating a safe working environment and reducing administration costs! This sounds like a business would highly benefit from getting a non-slip coating put onto the floor. 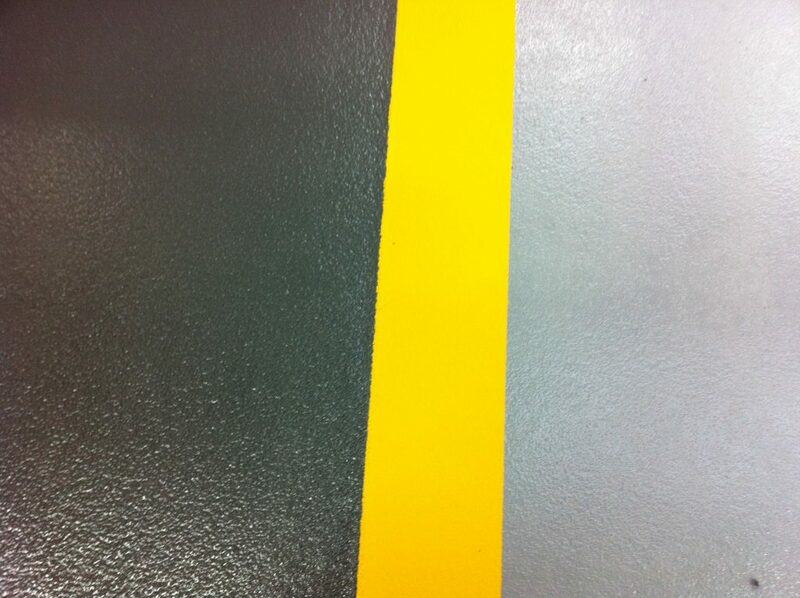 It looks like epoxy makes the perfect flooring solution for home garages and industrial spaces alike. Perfect for restaurant kitchens too!